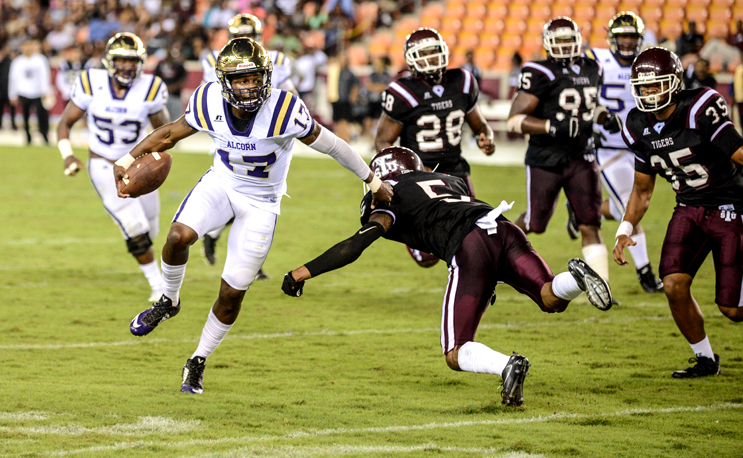 The SWAC East will be represented by Alcorn State in the conference title game for the fourth season in a row. The first half of the final SWAC Championship Game ticket has been punched, and its a familiar face heading to Houston. Alcorn State blew out and shutout in-state rival Mississippi Valley to come up with a 59-0 win to clinch its fourth-straight SWAC East title and a bid to the conference title game. Alcorn (7-3, 5-1 SWAC) will become the first team in the history of the league to play in four consecutive SWAC Championship games. outrushed the Delta Devils 424-to-negative 11. Sophomore quarterback Noah Johnson threw for 297 yards and three touchdowns, and rushed for 122 yards and two touchdowns. All three of his touchdown passes were caught by senior Norlando Veals who ended with a career-high 253 receiving yards. Senior running back De’Lance Turner registered 171 yards on the ground with two touchdowns. Junior P.J. Simmons, the reigning SWAC Newcomer of the Week winner, posted 97 rushing yards and a touchdown. Defensively, the Braves intercepted three passes and forced a fumble. Interceptions were made by senior Jalen Thomas, junior Leishaun Ealey and sophomore Allen Bruce. Senior Michael Brooks wrapped up a team-high seven tackles. MVSU was led by Dewayne Betts who threw for 158 yards off the bench. Delorean Parker stood out defensively with 11 tackles and 2.0 tackles for a loss. Alcorn State will play the winner of the Bayou Classic for the right to go to the Celebration Bowl. Southern and Grambling are both still in the running for the SWAC West title.